Add elegance to your bedroom with the Emily tufted button headboard. Designed with just the right amount of grace, Emily is made from fiberboard, plywood, and soft polyester upholstering for a construction that is both lightweight and long-lasting. Perfect for contemporary and modern bedrooms, sleep soundly with a piece that imparts a sense of tranquility amidst an impressive backdrop of style. Fits queen size beds. 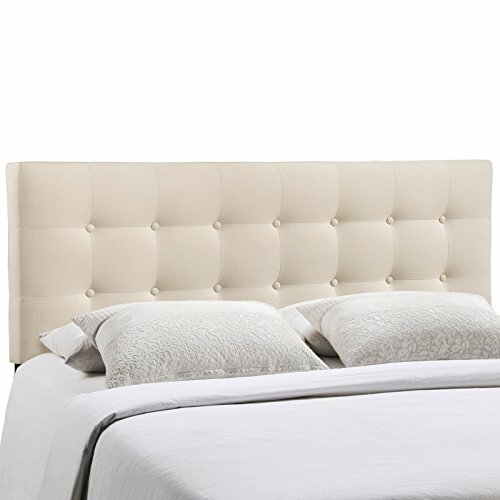 TUFTED DESIGN - Classically elegant, this headboard features a timeless tufted design that adds chic sophistication to any bedroom and creates an ideal backdrop for bedding and shams of many styles. SUPERIOR CONSTRUCTION - The headboard is constructed with durable fiberboard and plywood. With a sturdy frame, this headboard is built to last through the years. FINE UPHOLSTERY - Quality polyester fabric upholsters this graceful headboard. Boasting a tranquil hue, this piece incorporates a sense of calm and relaxation, establishing an ideal room for rest. STATEMENT PIECE - The perfect update for a master bedroom or guest room, this headboard makes an elegant statement wherever it rests thanks to its alluring characteristics and unique design.